This Group Buy offer has been closed. Note:– Any future testinside updates will be mailed to the contributors as usual. – Important Information regarding Testinside setup !!! If you install the Testinside setup on Windows Vista or 7 then you’d face a problem. It has been noticed that an older or some other version pops out even after the installation of new version in windows vista and 7. This problem doesn’t appear in windows XP. The solution is to run the installed exe file as Administrator. 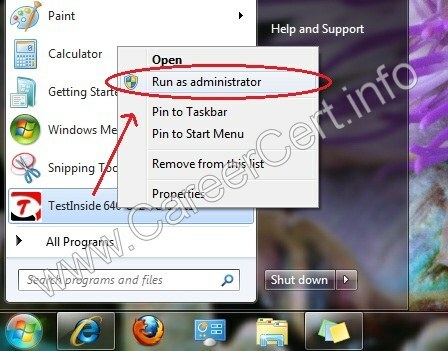 Right click the testinside exe file or shortcut in the start menu and choose “Run as Administrator“. This way you will be able to see the new version with full questions. @ the uy taking the esam on 17th May…did u take teh exam?? did u pass??? was teh dump helpful?? ?did u u use these dumps?? Am taking my exam on Monday 17th, 2010. Planning to buy this testinside, how lucky will i be using this, i see lot comments on new drap n drop questions, are they included in this testinside? Is there a new format or this 219 Qs is good enough? Thank God I got my CCDP May 1,I am now a CCNP AND CCDP. This is the track I took CCNA>CCNP>CCDA>CCDP> ??. what is best Track to take with the current IT trend after this? Is it CCIE, SECURITY,OR VOICE? Hi Careercert Please upload the latest drag and drop in the ccdp arch exams. can you please tell which drag and drop questions came in the exam? I have my exam april 30.
going to start studying for this now. give me a month and I'll contribute. There would be no changes in ARCH exam. It'll continue to be valid for coming months. I am planning to take the ccdp ARCH (642-873)IN 2-3 WEEKS WILL YOUR TESTINSIDE 219Q's BE VALID BY THEN.PLEASE LET ME KNOW. How long will the testinside ARCH (642-873) be valid before changes are made cos I will be taking the exams in 2-3 weeks? Is test inside 219Q's still valid? I have my exam first week of may.Thanks for the great job. Yesterday i passed ARCH (642-873) with 974 points. All questions except one was from TestInside. The missing questions is drag-drop about DTP and port states (Auto, On, Nonegotiate, Off/Access, Desirable). Thanks all for help. If something changes in the exam then it'll be updated in the material. whats this about changes to ccdp cisco exam -is the matrial changing ? is testinside 42-873 stil valid? If you have valid CCDA and CCNP certs, then you'll need only ARCH exam to become CCDP. If you are a CCDP, and you'll appear in ARCH exam then u'll become a CCDP as far as your CCNP should be valid. You're right ! Just one ARCH exam and you'll be CCDP ! Quick question: For CCDP what is the prerequisite? 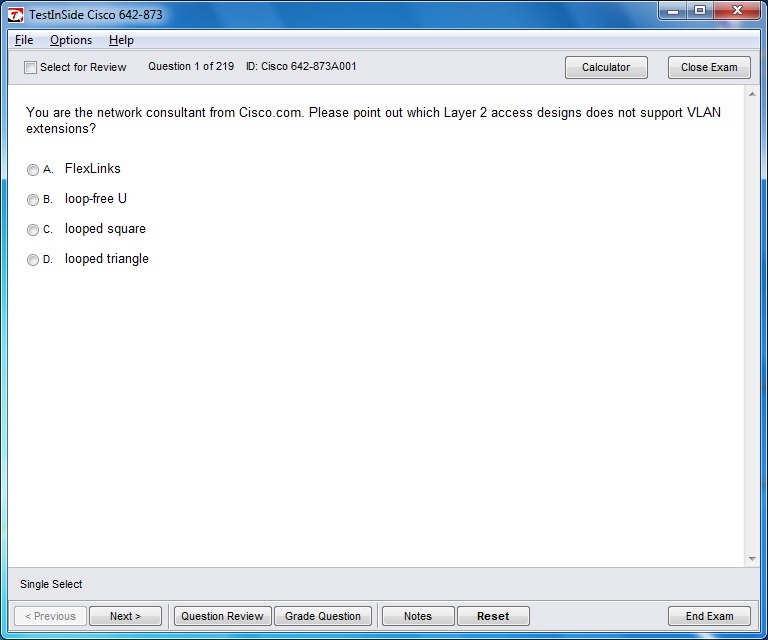 I checked on cisco website and it says CCNA and CCDA or any CCIE. I am a CCNP , so Iink was thinking if I give the ARCH exam will I be CCDP as well? i passed 642-873(arch) yesterday. almost all of the questions are came from test inside 219Q's. Noticed one new drag and drop but it was easy. Thanks Mr. Careercert. I am now a CCDP. just have contributed the group buy for test inside arch 642-873 219 questions from careercert. my exam is on Jan 18. will update for the result. thanks for all the material u have provided to this point. tell me some options to buy other than credit card and paypal please. waiting eagerly for the reply.